This is an artist's impression of a unique type of extrasolar planet discovered with the Hubble Space Telescope. The planet is so close it to its star that it completes an orbit in 10.5 hours. The planet is only 750,000 miles (about 1207 kilometres) from the star, or 1/130th the distance between Earth and the Sun. The Jupiter-sized planet orbits an unnamed red dwarf star that lies in the direction of the Galactic Centre; the exact stellar distance is unknown. Hubble detected the planet in a survey that identified 16 Jupiter-sized planets in short-period, edge-on orbits (as viewed from Earth) that pass in front of their parent stars. Hubble could not see the planets, but measured the dimming of starlight as the planets passed in front of their stars. This illustration presents a purely speculative view of what such a "hot Jupiter" might look like. It could have a powerful magnetic field that traps charged particles from the star. These particles create glowing auroral rings around the planet's magnetic poles. A powerful magnetic flux tube links the planet and star. This enhances stellar activity and triggers powerful flares. A powerful stellar wind creates a bow shock around the planet. 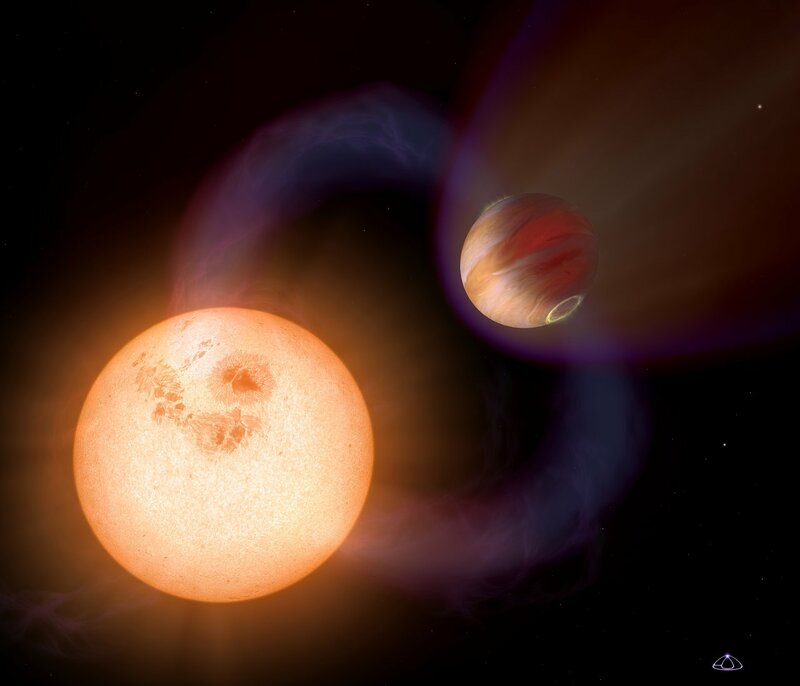 The planet's atmosphere seethes at 1,650 degrees Celsius.